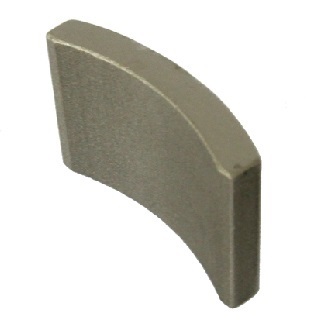 SmCo1:5 magnet is also called SmCo5.Which is composed by metallic samarium, cobalt and metallic praseodymium , are firstly those roughcasts with different properties and grades after series technology processing from melting, milling, and pressing to sintering in order. The (BH) max range is from 16 to 25, maximum working temperature 250°C. The physical character and ductibility of SmCo5 is better than Sm2Co17, so SmCo5 is slightly easier to be machined thin thickness disc or ring wall and complex shapes while Sm2Co17 is more brittle. Magnetization magnetic field of SmCo5 is lower than Sm2Co17’s. In general, SmCo5 can be magnetized saturated by 4000Gs magnetic field, however, magnetizing Sm2Co17 with high Hcj value need more than 6000Gs magnetic field. These days, prices of rare earth materials improved significantly, and the level of rare earth material around the magnet is up to 40%. For these reasons, the price of SmCo5 is more expensive than Sm2Co17. According to different using circumstance, customer can choose SmCo5 or Sm2Co17 reasonably. If customers need more details about SmCo5, please contact our technical adviser in Service and Support. For more information of SmCo5 grade date, please check the SmCo Magnet Performance Parameter Table. Physical properties please tap Application Technology.